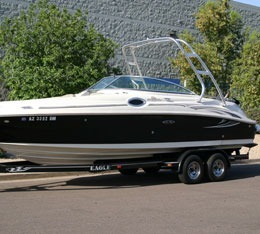 Fluid Concepts manufactures boat products designed for wakeboarding and wakesurfing. 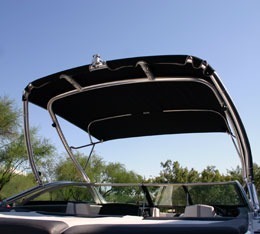 Focusing on building high quality wakeboard towers, board racks, and integrated bimini tops, we can help you get the most from your boat. 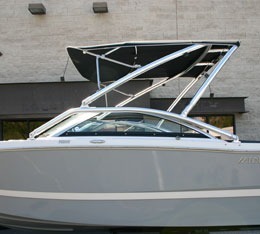 We also specialize in designing and building custom bimini tops for boats with towers and difficult applications. All Fluid Concepts products are built here in Arizona. Additionally, we try to use domestic components whenever possible to ensure superior end products with maximum durability. Our in-house fabrication shop capabilities include welding, bending, CNC machining, and industrial sewing. OEM's welcome. A High quality fixed-mount affordable rack for older Supra Rad-A-Cage towers. A High quality fixed-mount affordable wakeboard rack for older model Moomba Rad-A-Cage towers.